Assistive Technology – MERIL – Helping People with Disabilities Live Independently! 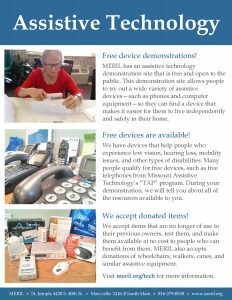 MERIL has an assistive technology demonstration site that is free and open to the public. This demonstration site allows people to try out a wide variety of assistive devices—such as phones and computer equipment—so they can find a device that makes it easier for them to live independently and safely in their home. Call us at 816-279-8558 to schedule an appointment. We have devices that help people who experience low vision, hearing loss, mobility issues, and other types of disabilities. Many people qualify for free devices, such as free telephones from Missouri Assistive Technology’s “TAP” program. During your demonstration, we will tell you about all of the resources available to you. We provide low vision aids (such as optical magnifiers) and equipment for people age fifty-five (55) and over with low vision. MERIL staff have been trained by Rehabilitation Services for the Blind to be specialists in providing quality services in rehabilitation and equipment for people who are blind and those with low vision. We accept items that are no longer of use to their previous owners, test them, and make them available at no cost to people who can benefit from them. MERIL also accepts donations of wheelchairs, walkers, canes, and similar assistive equipment. 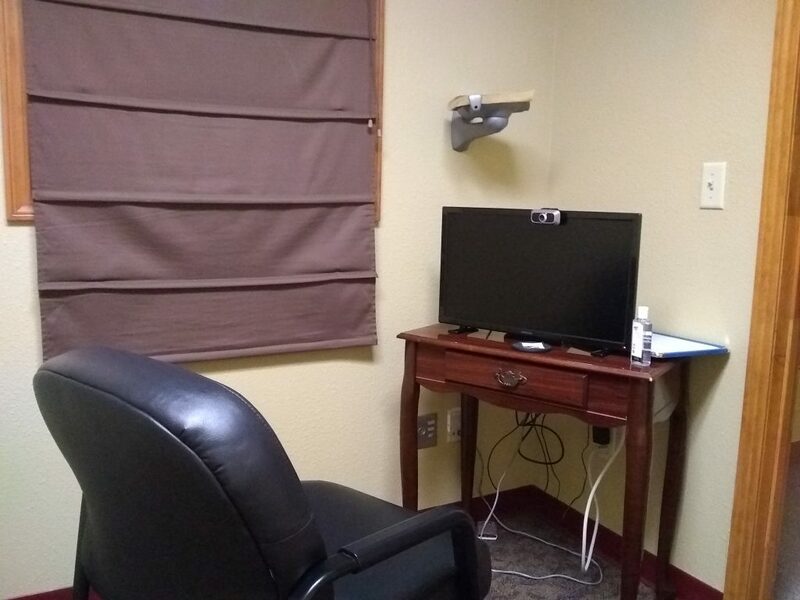 A public video phone is available at the MERIL office in St. Joseph. This service is free to those who are Deaf or Hard of Hearing. 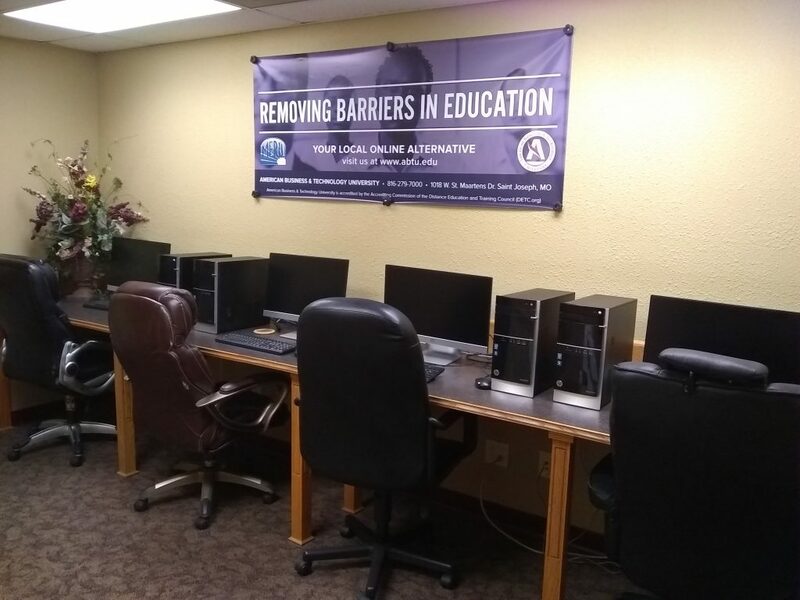 Our public computer lab is available during normal business hours, 8:00 am to 5:00 pm, Monday through Friday, at our St. Joseph office. American Business & Technology University (ABTU) generously donated four new computers and flat screen monitors in an effort to help remove barriers in education. All of these computers are equipped with internet access. Money Follows the Person (MFP) is a program that provides funding for people with disabilities who want to live in their own homes instead of in a nursing home or residential care facility. MERIL provides information and personalized guidance to those who participate in the program. Roberta Patterson was living in a nursing home due to an amputation to her right leg. The social services specialist at the home referred Roberta to the MFP program at MERIL. Roberta met with MERIL specialist Lisa Gabriel to begin the process of moving from the home into an apartment. Roberta has been living in her own apartment since January 2018. 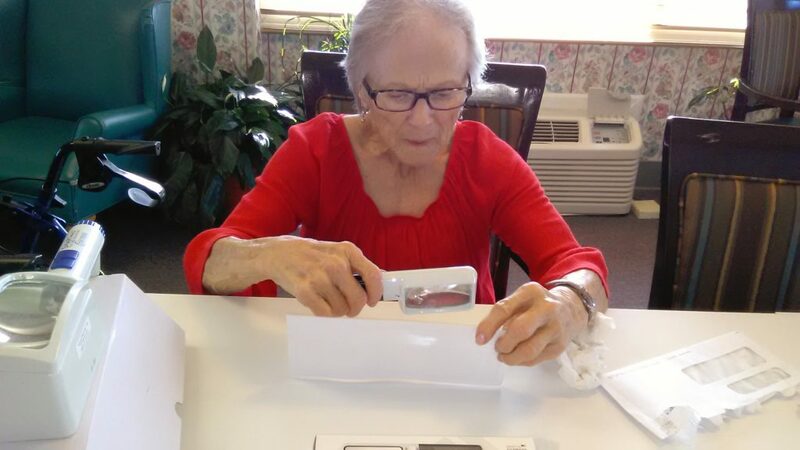 In addition to using MFP, Roberta was able to receive items from Missouri Assistive Technology. 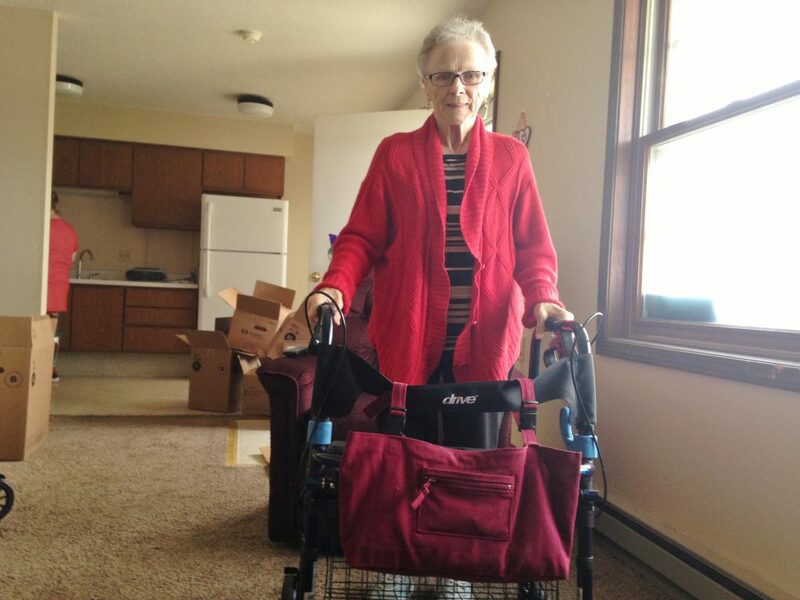 These items, including a chair lift and rollator, have made it easier for her to live in her apartment. MERIL intern Will Vick demonstrates the ScripTalk device. This month we are featuring the ScripTalk prescription reader. 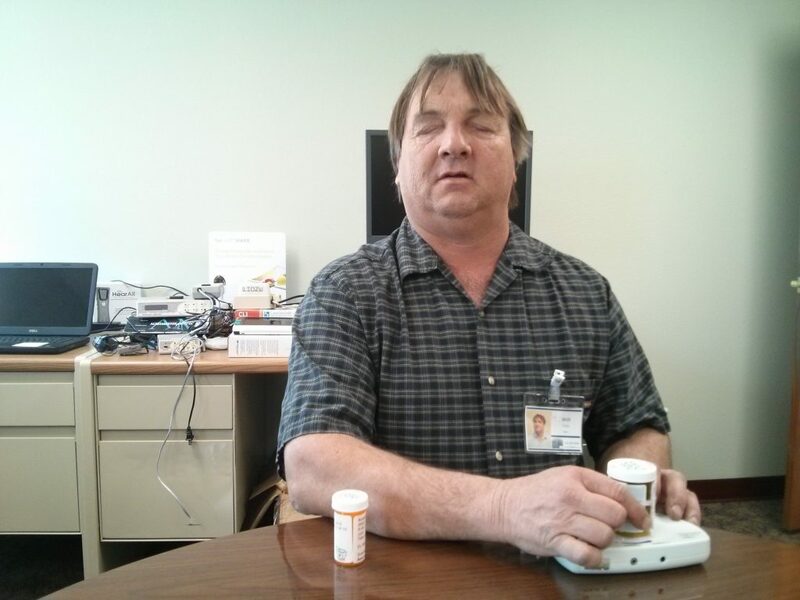 This device reads aloud prescription label contents using an RFID chip. This is useful because many prescription labels provide only some of the medical information in a Braille format. With the RFID chip, the patient can hear all of the information about the medication. 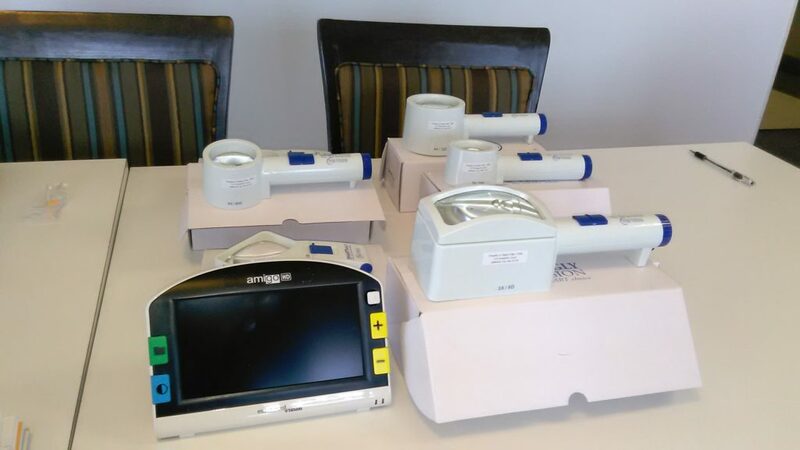 Visit www.envisionamerica.com to learn more about the device. 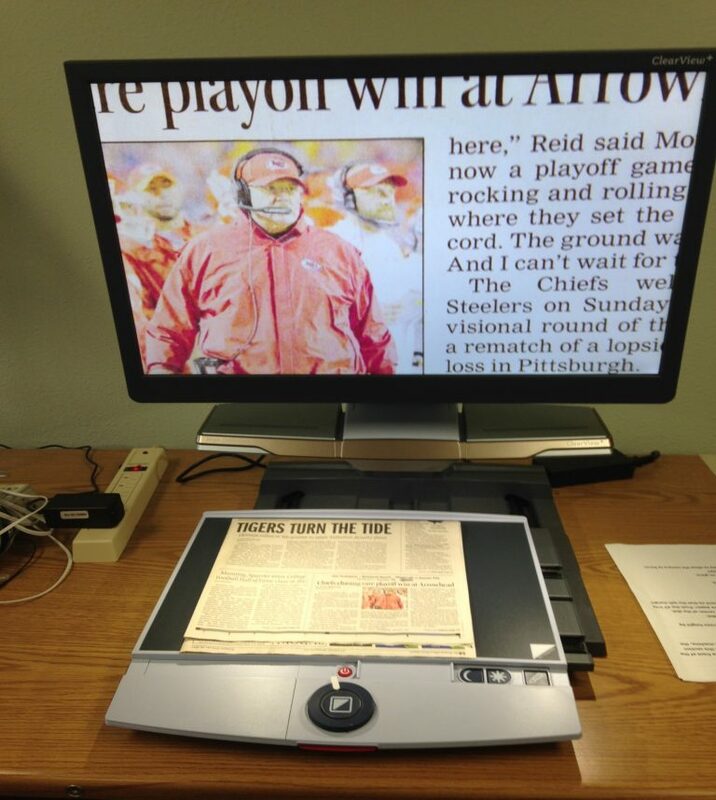 This month we are featuring our Clearview digital magnifier. You can use this device for things like paying your bills, reading the news, and other things that might otherwise be difficult to do because of small print and picture size. This magnifier has several features besides just magnification that make reading easier and more enjoyable. In addition, you can use our computer lab for access to the Internet. 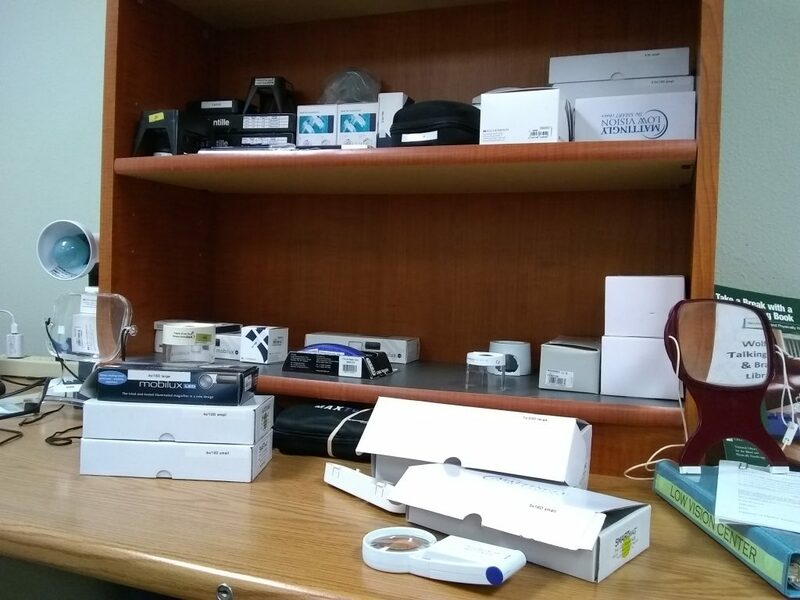 When you visit our office, we will demonstrate these items so that you can see how easy they can be to use. We will also discuss possible financial assistance for purchasing a device. 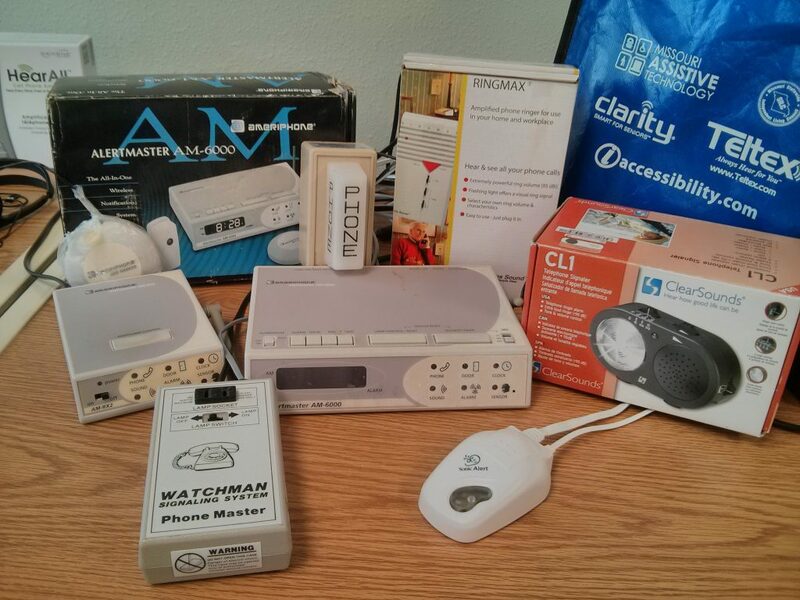 We are an official demonstration center for Missouri Assistive Technology devices. Demonstrations are free to the public, and there are many financing options if you want to purchase an item. 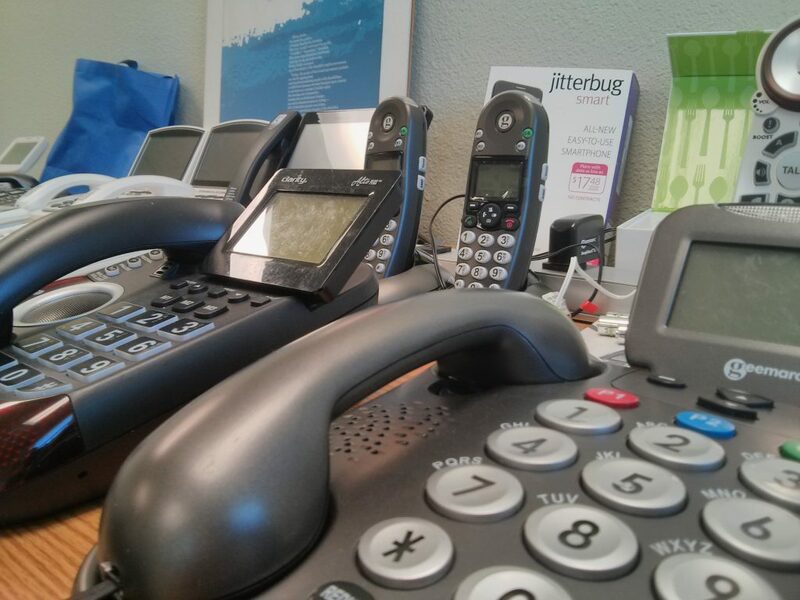 Some devices, such as telephones through the TAP program, are available for free to many people. Visit https://at.mo.gov for more information.